Occasionally, Friends of the Wild Whoopers, (FOTWW) is asked how someone can help or donate to FOTWW when their own personal funds are tight and they cannot currently contribute financially. FOTWW has registered with Goodsearch and Amazon Smile to allow those unable to contribute financially to actually contribute when they search or make online purchases. When you shop @AmazonSmile, Amazon will make a donation to Friends Of The Wild Whoopers. Once you register with AmazonSmile, choose Friends of the Wild Whoopers as your charity organization and start shopping. AmazonSmile will donate .5% (1/2%) of your purchase, excluding shipping, to us. 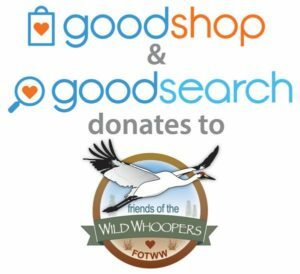 Goodsearch and Goodshop is a simple, easy and free way to make a difference — each time you search the web (though Yahoo!-powered Goodsearch), shop online (at the 2,800+ stores on Goodshop), Goodsearch and Goodshop makes a donation to FOTWW. Click on the image below to register for free and choose Friends of the Wild Whoopers as your charity organization.